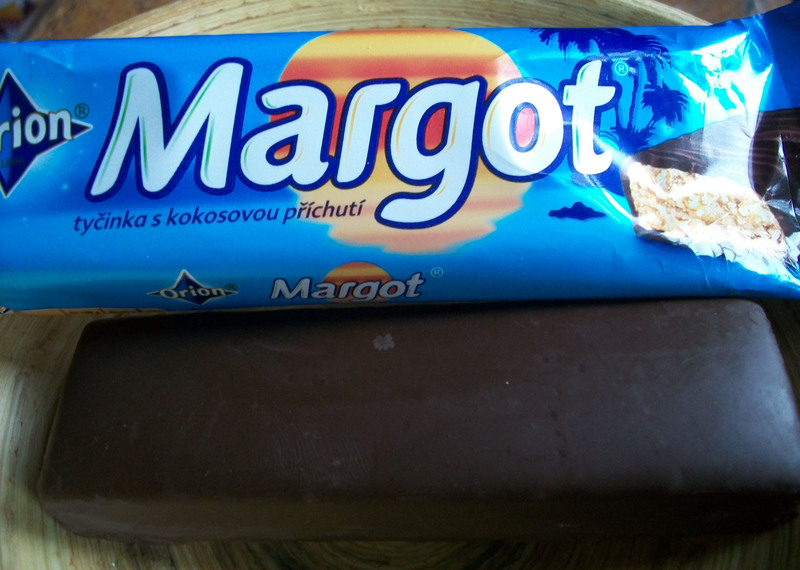 For this Sweet Saturday, I’m reviewing the Orion Margot Candy Bar (Nestle) which was purchased for $1.50 at Milan’s, a Slovakian restaurant in Greenwood Heights, Brooklyn. Eating there with a friend the other day, I noticed a stash of candy bars and magazines on a corner shelf. I chose this one because of the lovely blue wrapper. Oddly, Margot is coconut flavored despite coming from a landlocked, non-tropical country. Kudos to Nestle for using real coconut. (I’d tried several island based candies recently, like Tiki Gold which contained exactly 0% coconut. That is about the only positive about this candy bar. The bar itself is plain jane without any brand or design etched into it. Cutting it open, it’s chockfull of a brown coconut-y mixture. The first bite revealed a pleasant texture, not unlike a Bounty bar. The flavor though was the worst thing ever. Any coconut tidbit is negated by the overwhelming scent of alcohol. In fact, immediately after taking a bite my stomach felt hot. Verdict: Unless you know for sure that the candy is new, never purchase the Orion Margot bar. Have you ever tried this candy? 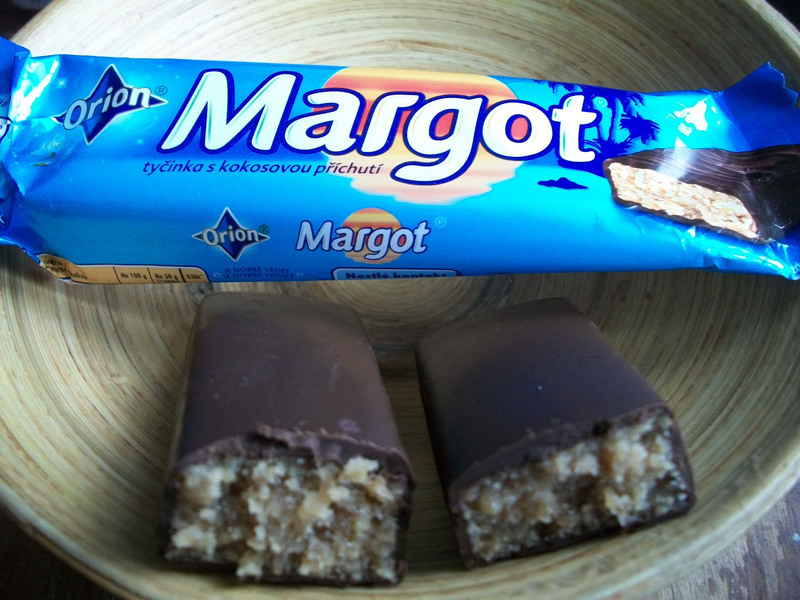 Haha, I reviewed an Orion Margot bar a while ago and absolutely hated it! Never again! Haha yeah I’d actually say it’s a contender for the worst candy I’ve ever had. Thanks for the comment. I like your site. Cheers. Funny things, I googled this bar because I loved it, it reminded me of candy bar I eat as a kid. I think it’s only great for us from those parts of Europe as we grew with that taste. Maybe, that’s the reason I find American candy so sweet that I can never eat them. Thanks for the comment Lana. It’s funny how tastes can be different place to place. I’ve definitely heard people mention how disturbingly sweet American candy is. I love these, but I am CZ..
Haha no worries. Maybe I just got a bad one. I’ll give it another try. Cheers. I just ate one of those and it tasted like nail polish remover! Anyone else think this? Haha Mostly it seems people who are not based in Czech or Slovakia are in agreement on this. Thanks for the comment. Was on a three hour road trip with no food stopped at a gas station and purchased one of these bars I think I contracted multiple types of cancer from just smelling the bar and dozens more when I finnaly tasted it… It tastes like Chernobyl. I would not eat this bar again to save my children’s lives. These are made with a lot of rum! New or not, this will be your experience. Ah.. that makes so much sense now. Thanks for the comment.
. My wife Margot received this recently from a friend. We tried it just now and we rather pleasantly surprised by the alcohol content. (No warmth in our stomachs.) A nice touch! PS We’ve both spent many years in Europe and East Asia and prefer chocolate bars that are less sweet. I’ve not bought a chocolate bar in North America for decades because they’re too sweet. Haha glad you had a better experience than me. Thanks for the comment.